Choosing between liposuction and CoolSculpting can seem very confusing at first. When it comes to removing unwanted fat, it is the final result that really matters. After all, fat removal is going to cost thousands of dollars not matter where you go, so it better work! Both liposuction (also referred to as liposculpture, lipo, lipoplasty, and suction-assisted fat removal) and CoolSculpting promise a better body through removing unwanted, excess fat. This can mean a reduced muffin top, or better appearing love handles. That unwanted fat from your thighs, abdomen, and buttocks can be significantly reduced. Even excess fat around the neck, face, and chin can be improved significantly. However, liposuction and CoolSculpting work totally differently and produce significantly different levels of results. Liposuction is the time-proven method of removing unwanted fat. Liposuction has been around for decades and has underdone decades of refinements and improvements. 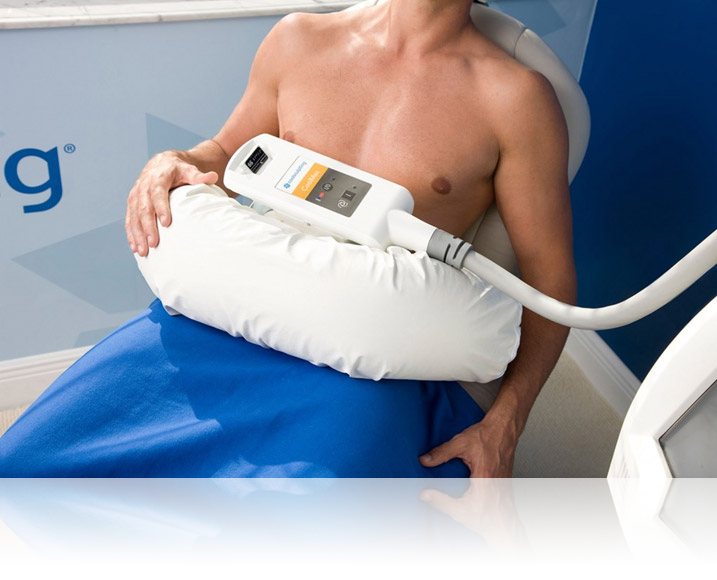 It removes problematic fat from the body entirely by suctioning the fat out with blunt, metal tubes. Nowadays, the smallest modern tubes (called cannulas) are amazingly delicate instruments – about the diameter of a tiny red cocktail straw. The liposuction procedure that uses these ultra small modern tubes is often referred to as “Liposculpture”. With the advent of modern “Liposculpture” techniques and miniature cannulas, plastic surgeons can meticulously and artistically sculpt down bulges of unwanted fat in the office in a highly controlled fashion. The treated area is first gently numbed and the patient is totally awake for the entire procedure. During “Liposculpture”, I first outline the problem area, and after the patient confirms, I carefully inserts the tiny tubes under the skin, and gently remove the unwanted fat via suction. The suctioned fat is removed and collected into a container – both the surgeon and the patient can physically see the fat that was removed. No gimmicks! During Liposculpture, the patient is under local anesthetic throughout the procedure, thus can talk to the plastic surgeon – essentially pain free – while the procedure takes place in the office setting. Liposuction is indeed a precise, controlled, and permanent fat-removal method. CoolSculpting, on the other hand, claims to work by freezing fat cells without surgery. To perform CoolSculpting, a physician fastens large cooling panels to the skin to supposedly freeze the unwanted area of fat for approximately an hour. The idea is through cooling the skin, the fatty cells underneath the skin will somehow freeze, and eventually die. Some of the treated fat will supposedly go away in the next few months after the procedure. Nothing is collected in a container and nothing is physically removed from the patient on the day of the procedure. The criticism, of course, it how controlled can that supposed removal of fat really be? Some may be surprised to learn that CoolSculpting is very often performed by non-plastic surgeons who just decided one day to purchase the CoolSculpting machine. To perform a CoolSculpting procedure, a physician only needs to take a short instructional course. Often, these physicians have no formal plastic surgery training, even though removing fat is indeed a cosmetic procedure. The physicians performing this procedure may actually be gynecologists, family doctors, dermatologists, emergency room physicians, etc. One way to find out the true background and training of any physician offering CoolSculpting or even Liposuction is to do a free credentials check of your doctor online at www.CertificationMatters.org Even if the physician is a true board certified plastic surgeon who happened to purchase the machine, how effective is it at removing fat? In theory, CoolSculpting sounds like a good alternative to surgically removing fat, however the results aren’t nearly as impressive as liposuction (liposculpture). The marketing, however, for CoolSculpting focuses on capturing clients based on the concept of removing their fat “without surgery” which is understandably very appealing to the average consumer. Because CoolSculpting does not physically remove the fat on the day of the procedure, it is estimated that only around twenty percent of the fat cells will eventually die. What? Only 20% improvement! Perhaps that may not even be noticeable at all. These dead fat cells are left to be absorbed into the body – supposedly. Therefore, multiple repeat procedures are required on the same area of fat bulge just to achieve a slightly noticeable fat reduction of the bulge. These multiple repeat procedures on the exact same area cost extra money, and by the end, many patients spend the same if not more than a liposuction (liposculpture) procedure would have cost them on the same area, without achieving the same results. Many clients, however, still fall for the slick marketing commercials that focus on fat removal “without surgery”. It seems that liposuction (liposculpture particularly) is likely still the best option to truly remove unwanted fat entirely, and permanently on the day of the procedure in a controlled fashion. The way I see it, it would be wisest to choose a properly credentialed plastic surgeon who will carefully and precisely eliminate the unwanted fat with liposuction (liposculpture). Other less expensive “non-surgical” options certainly exist, but these methods are not necessarily cheaper (in the long run) nor are they equally effective.